Come on down the shore, and enjoy yourself by supporting a great cause! This event is being presented by the Thunderbird District, Monmouth Council BSA, and all proceeds support Scouting and Exploring in Monmouth Council. 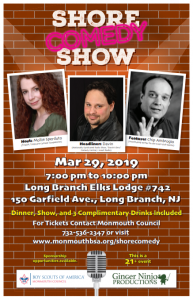 Headlining this show is Davin (Comedy Central, I Heart Radio, Nationally syndicated radio show, “Davin’s Den,” entertained the troops overseas), featuring Chip Ambrogio (Contributing writer for the Friar’s Club) along with your host Mollie Sperduto (Finalist, Tropicana Comedy Competition). Dinner starts at 7PM (3 complementary drinks included), with the show to follow. Admission is $50 per person, $90 per couple. To reserve tickets, click here or call 732-536-2347.